So this week saw Hurricane Matthew passing us by in Eleuthera and then travels with Mary – to Fort Lauderdale. Firstly we are all so incredibly grateful that Hurricane Matthew took a turn to the west and barely brushed us really. 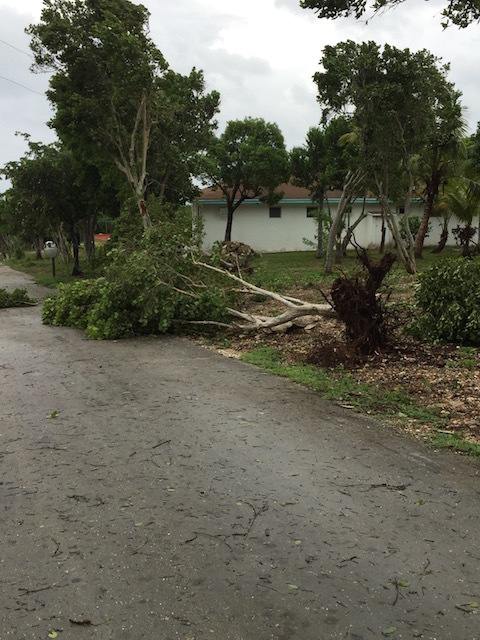 We had some incredible horizontal rain – for long periods of time and some very strong gusty winds – but the real wrath of the hurricane missed us and sadly struck at some of the other islands of the Bahamas. Nassau had it’s first direct hit by a hurricane since 1929 !!! Amazing that they have escaped for so many years – we were all so very thankful that we were spared on this occasion but feel a real sense of grief for what the other islands – including of course poor Haiti – along with the east coast of the US – have suffered. A few trees uprooted – that’s all…. Going through the preparations for the hurricane is a strange thing – it is all activity in the 2 days before and the town is buzzing – the checkout lines at the food stores are crazy – like Christmas but without the fun ….. Then we go on lockdown in the house – nobody really ventures out at all once the rains and the winds hit. At first I could take Rudge out to pee in the garden – but then it reaches a point where that is not viable anymore. 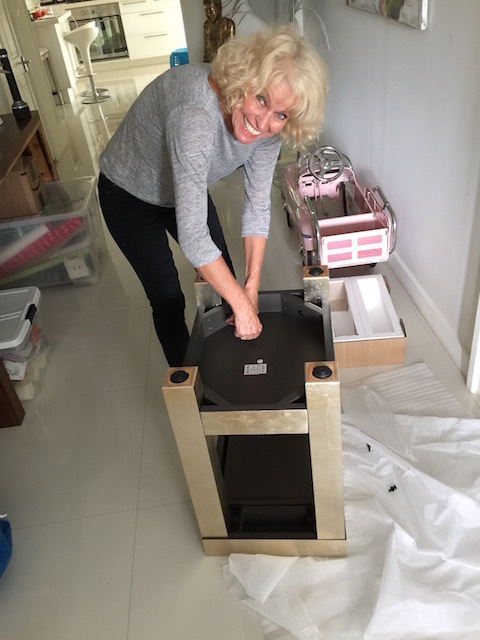 I started cooking – a great chicken and sweetcorn soup if you are asking – and Bob began assembling his new home gym ! It took him the 2 days that we were on lockdown – but he was fitter for just having put it together !!!! I had cooked all sorts of food that we would not normally be eating but what else is there to do? We were without power continuously for just over 24 hours – so not too bad this time. But just long enough for the beer to not be really cold anymore ! 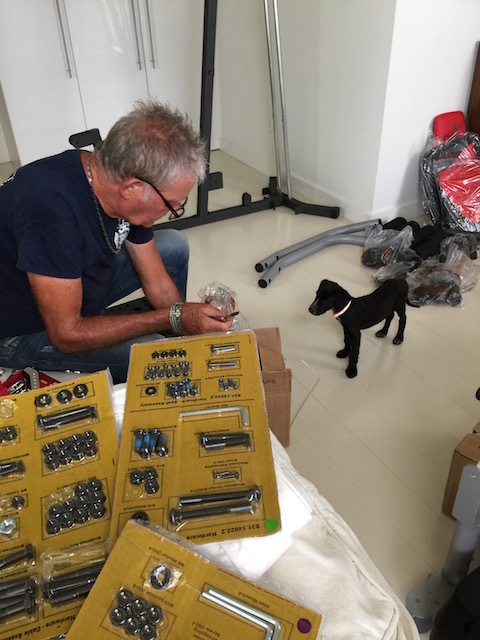 Things to do in a hurricane 2 – assemble a home gym with only assistance from Rudge !!!! Oh the relief of having finished assembling the damn thing ! – note beer in hand !! 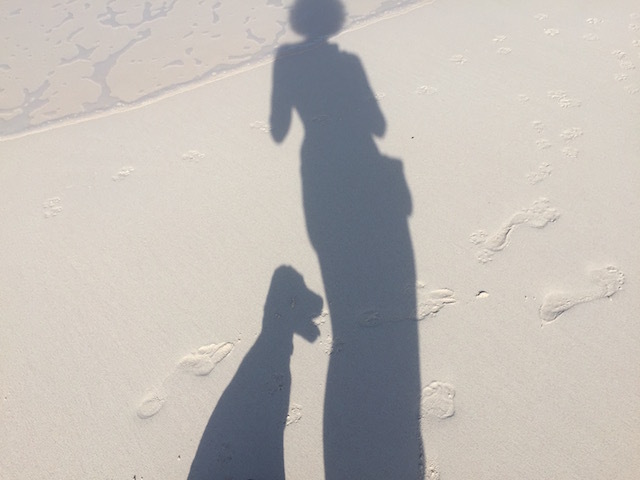 Been cooped up too long and started taking strange shadow pictures on the beach ! 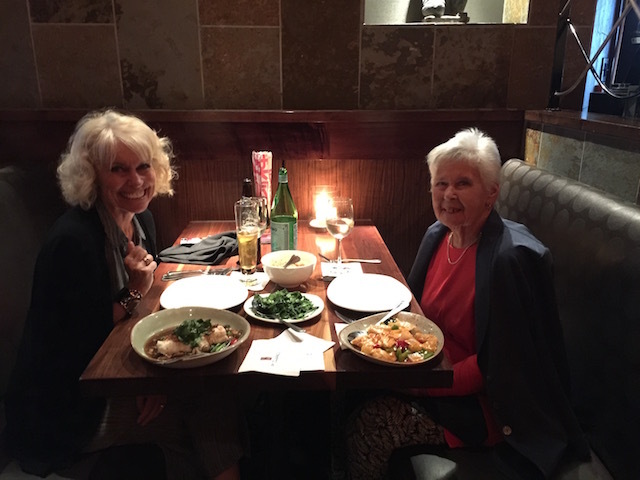 I had had to cancel a trip that week to Fort Lauderdale with my lovely Mum – Mary – but rescheduled it for the beginning of this week. 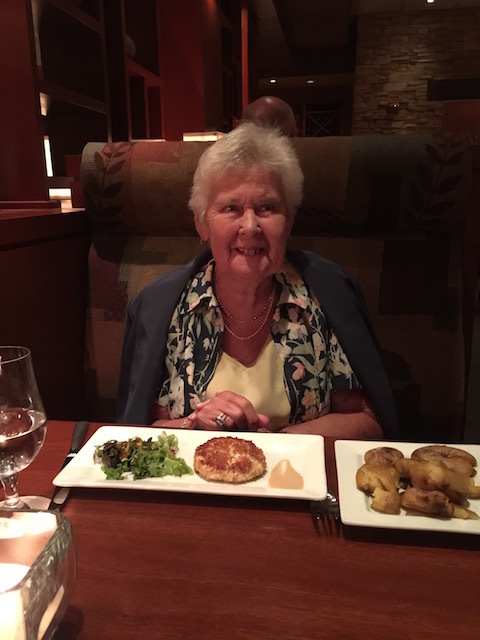 We flew from North Eleuthera with Watermakers Air in FT Lauderdale Executive Airport – absolutely ideal with Mum as there were no long lines for immigration to wait in and we were quickly wisked off to our hotel. Then the fun started – I went to pick up a rental car only to discover that I had not got my driving license with me – oh s–t! You are not allowed to rent car without producing your driving license so that was that ! Fortunately at our hotel I talked with a very helpful young man who does valet parking who put me in touch with a driver who I hired for 5 hours to drive us to the dentist – yes that is why Mum was taking a trip off island. 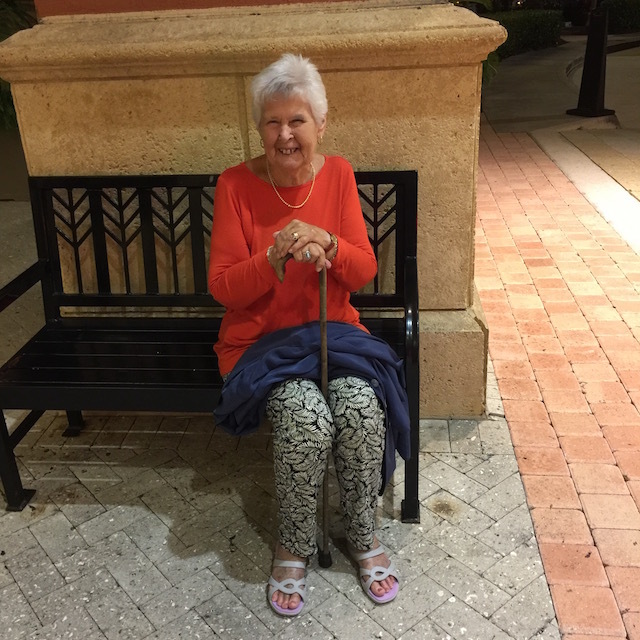 Our terrific dentist Dr Stone of Oakland Park Blvd was so lovely with Mum – his calm and gentle friendly manner put her at her ease and made what could have been a traumatic experience into a positive one. A second visit on Wednesday before we flew back and suddenly we were home again……. Hopefully just one more visit and then she can flash a new smile ! Rudge was boarded out again with his litter brother Rufus and the kind and generous Dan and Larry of the Cay and I’m sure will be thrilled with his new toys etc I couldn’t resist buying for him. Well we need generators for all the houses – how could I put one in for us and not for the other houses ???? A costly exercise – all contributions gratefully received ! Mum really did glow on the trip ! So glad Eleuthera was spared, although unfortunate for other islanders! You all look terrific… especially the “orange” (We know why!) top you got for Mary. Rudge is absolutely adorable is his diminutive size next to Bob. So glad Eleuthera was spared, although unfortunate for other islanders. Rudge is absolutely adorable in his diminutive size next to Bob. 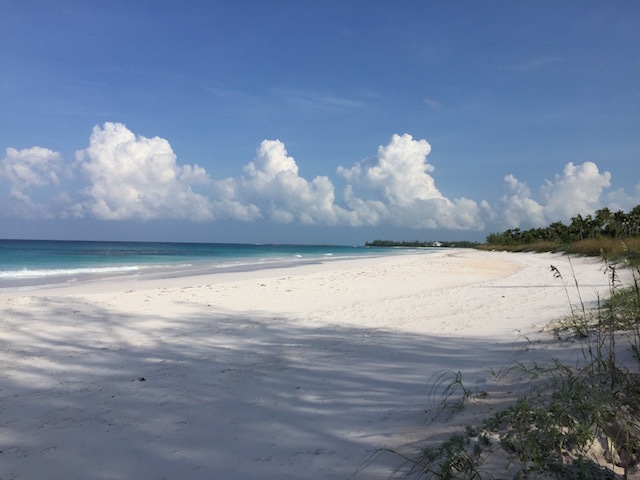 So happy for friends in Eleuthera that the Island was spared a major hit. I just got back from Bermuda where I experienced Hurricane Nicole first hand. Started early Thursday and all of a sudden midday the world stopped and there was complete calm. I thought it was over but my friends assured me it was just the eye of the storm passing over. Then it started up again with a fierce roar and lasted until the evening. I was staying with friends on the water but at no time was there any danger. They are prepared for hurricanes and the house was built like a fortress. I couldn’t help but think of Haiti and the poor people who didn’t have a change against Mother Nature. Cheers. When you have actually been through a hurricane it gives you a very different perspective…. So pleased that you were safe and sound in a house like a fortress ! See you soon we hope. 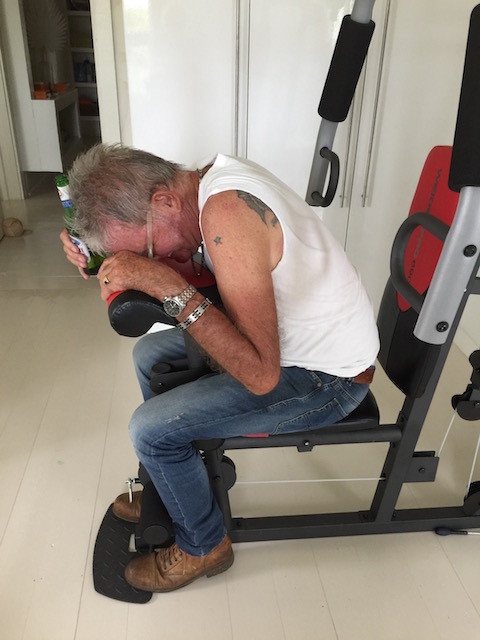 Thanks so much – lovely to hear from you and looking forward to seeing you both soon I hope…..